In a very unsurprising move, the Supreme Court overruled the Central Elections Commission and determined that MK Hanin Zoabi of the Balad party can run in the upcoming elections. Despite the Elections Commission being clearly right in saying she breached the requirements regarding who is not allowed to run, and the Supreme Court being clearly wrong in having overruled them, I probably have to support Zoabi’s right to run. Zoabi, as you should recall, was an involved passenger on the Mavi Marmara blockade run attempt in 2010. On the Mavi Marmara, a group of passengers, connected to the Turkish IHH (designated as a terror organization by Israel), attacked IDF naval troops, including with at least one gun, during their attempt to break the blockade of Hamas terror-controlled Gaza and provide aid to Israel’s enemy. Zoabi set off a political storm in Israel with her participation on that particular boat. So you must be asking yourself, why am I supporting her right to run in the Knesset, despite her association with known terrorists and attempting to aid the enemy? 1. The rejection of Israel's right to exist as a Jewish and democratic state. 3. Support of the armed struggle of enemy states or terrorist organizations against the state of Israel. 4. A reasonable basis to conclude that the party will be used for illegal activities. Zoabi seems to clearly be in violation of at least #1 and #3. And the Balad party’s stated goal is the "struggle to transform the state of Israel into a democracy for all its citizens, irrespective of national or ethnic identity," is clearly in violation of #1. And its not like there isn’t history here. You might recall the famous case of MK Azmi Bishara, not coincidentally, also from the Balad party. Bishara ran away before he could be arrested for actively aiding Hezbollah during the Second Lebanon War. And then the Knesset banned the Balad party, but once again the Supreme Court overruled them and let Balad run. I have two reasons for this admittedly strange position. The first is that it’s a badly written law. It’s vague and it potentially chills free speech. Parts of the law above are incredibly vague (such as #2), and there’s far too much wiggle room that allows it to be spuriously applied to any political enemy, such as the recent attempts to use it against Ben-Ari and Naftali Bennett, in an attempt to block them from running. It’s a law crying out for selective abuse, just as it was selectively abused in the past against another rightwing party who was becoming very popular, and yet it was never used against any leftwing anti-Jewish parties (such as Shinui) or anti-Settler parties (such as Meretz), no matter how racist they might be considered, nor despite their attempts to remove the Jewish component from Israel’s definition as a Jewish and democratic state. In short, the law is poorly written, it is selectively applied, and until the law is fixed, it’s problematic to have it applied to anyone, since it can be used against any political enemy. The second and perhaps more important reason is that the Knesset dropped the ball. IHH is designated a terrorist organization. Zoabi was on the boat with a terrorist organization to break the Israeli government’s lawful blockade on a terrorist entity. Why didn’t the Knesset do its equivalent of impeaching her? Why did the government fail in its charges against her participation in the Mavi Marmara? Simply because she claimed she was acting independent from the IHH! For heaven's sake, why isn’t Zoabi sitting in jail? The government dropped the ball, in another place. And perhaps not where you think. The government also dropped the ball, because it still hasn’t fought the Supreme Court, and their self-assumed right to overrule any Knesset ruling they don’t like. Until the Knesset decides to take a clear position that the Supreme Court is overstepping its bounds and taking on powers it doesn’t have, then the Knesset deserves every slap in the face it gets from the Supreme Court. One of the most serious of problems that Israel faces is the unclear delineation and definition of powers, and that is specifically the Knesset’s job to define in law. So instead, we have ridiculous situations like this, where we have a party and an individual who is in clear violation of the law, but because the Supreme Court doesn’t like that particular application of the law, it ignores it. And we have a Knesset that is afraid or unable to stand up for its rights and say "We represent the democratic will of the people, and you, the Supreme Court, have overstepped your bounds of your mandate." Just like the Knesset was afraid to go all the way and impeach Zoabi, and just like Bishara actually continued to receive money from the Knesset for quite a while after his escape. The Knesset is afraid to properly deal with issues. Other examples of this failure are the Women at the Wall, and the Reform Movement, and the rights of Jews to buy and own properties in Hebron. And that leaves outside interested parties the ability to appeal to the Supreme Court and override the will of the people. So I say, yes, if the Knesset isn’t willing to properly deal with Zoabi and put her in jail where I think she belongs, and it isn’t willing to deal with a runaway Supreme Court, then it gets what it deserves, and it deserves to have Zoabi as a member. Back in Yeshiva elementary school I was introduced to the holiday of Nittel Nacht, which happened to coincidentally always fall on the eve of December 25th. There was excitement in the class, a night that it is assur (forbidden) to learn Torah! "What do we do instead?" a fellow classmate asked. And we nearly all fell off our chairs when the answer from the Rabbi was, "Stay home and play cards," which was, of course, amazing, since we were taught, playing cards wasn't even allowed on Shabbat. And the Rabbi explained to us why. The night of Nittel Nacht is one of great impurity, where evil and dangerous spirits run around outside, so we aren't allowed to go outside, so they couldn't harm us. And since we must be inside with nothing to do, we should normally be learning Torah. But since we don't want those evil spirits to get the Zechut (merit) for our Torah learning, since we can't go outside because of them, we do meaningless things instead. But I always wondered about one contradiction. Since we were also taught that the world continues to exist, only because there is always at least one person learning Torah at any time, if we're telling everyone not to learn at the same time, wouldn't the world be destroyed? There are additonal customs associated with Nittel Nacht, such as eating garlic to ward off the demons (particularly you know whose), praying Aleinu out loud (since that is the prayer against idolatry), and not going to sleep all night. You can read about more Nittel Nacht customs on Hirhurim. But now, lets step back a bit from the edge. The custom obviously began in Jewish communities that lived among Christians. On Christmas Eve (on whichever date they celebrated it on in that community), the Christians would get plastered (with spirits) and wander the streets beating up Jews and organizing pogroms, and killing more Jews. So as a result, Jews learned that on Christmas, don't let the drunk goyim see you, and then they won't kill you. So Jews didn't go outside to the Beis Midrash or the Shul. As to not learning, obviously people started coming up with additional explanations as to why we don't learn, though I think the most likely is that if the Christians saw a light on in your house (so you could read your book), they were likely to remember you were there and then try to burn the house down with you in it. And the same thing for not going to sleep. How would you see the drunk Christians were approaching to burn down your house, if you weren't awake to see them coming, and run? So, the voodoo explanations aside, historically there was very good reason for Jews to not go outside on Nittel Nacht. In fact, I would say that today (for people in America and Modi'in), the visual and audio spiritual impurity issues are far more relevant reasons why one should not go outside on Nittel Nacht, as opposed to the more traditional dangers of Christian violence and pogroms. But, my original question regarding Torah learning has never been answered to my satisfaction. Because if I was planning to be learning Torah anyway, there is no way the evil forces should see any merit from my actions, and if there isn't at least one person learning Torah, what would support the world? So, tonight on Nittel Nacht, I won't be going outside, even though I'm in Eretz Yisrael and we don't really have that problem here, but I will be learning Torah, because why should we allow evil forces to cause Bittul Torah (a cancellation of Torah), and perhaps, with everyone else not learning Torah, perhaps I could get to be the one who supports the entire world!. 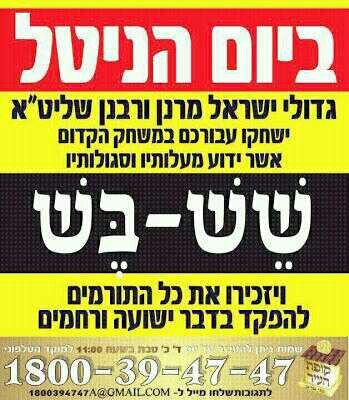 So I say, just say no to Nittel Nacht, or at least the part without Torah learning. "Two-thirds of centrist voters - defined as Labor Party and Yesh Atid supporters..."
On Hanukkah, while lighting candles, we declare we're lighting the candles for Hanukkah, and that we're not allowed to benefit from their light. This declaration, in Hebrew known as "Ha-Nerot Hallalu" (These Candles) appears in the "Tractate of the Scribes" (Masechet Sofrim). In this early Halachik work, written in Israel around the 8th century (the Gaonic Era), we have a description of the ceremony of lighting Hanukkah candles, as it was done in ancient Israel. We light these candles on account of the triumphs and miracles and wonders which You performed for our fathers through Your holy priests. Throughout these eight days of Hanukkah, these candles are sacred, and we are not permitted to make any use of them, but we should observe them in order to praise Your great name for Your wonders and Your miracles and Your triumphs. The person lighting then adds two additional blessings: Shehecheyanu and the blessing over the Hanukkah miracle (Al Ha-Nissim). The participants repeat the last two blessings. On the other days of the holiday, the person lighting the candles blesses upon lighting the candles and makes the aforementioned Declaration. The participants say the blessing for the Hanukkah miracle. This Israeli custom was generally forgotten and was not mentioned by any other Halachic books in the centuries following . That is, until the 13th century, when the Israeli tradition was revived thanks to the custom of a German Rabbi. Rabbi Meir of Rothenburg, also known as the Maharam of Rothenburg, loved the Israeli traditions. He adopted the custom to say the "These Candles" declaration, based on the language of Masechet Sofrim. His students reported this custom, and the prayer went viral. The custom to say "Ha-Nerot Hallalu" was adopted all across the Jewish world by both Ashekanzi and Sephardi communities. The Maharam of Rothenburg didn't just love Israel from afar. In 1286 he led dozens of Jewish families towards Israel. However, he didn't make it. He was caught in Italy and accused of leading a mass escape from Germany, a crime at the time, as the Jews were by then property of the king. He was imprisoned and died in a dingy pit, sacrificing his life for the right of return to Palestine! An edict confiscating the property of the "escaping" Jews, documents that they came from various towns in Germany: Mainz, Worms, Speyer, Oppenheim and Wetterau. I had often wondered, if Jews love Israel so much, why didn't they just get up and come here. The Mahram's Aliyah attempt showed that Jews did. They weren't always successful, many times they perished on the way or soon after they got here, but they continued trying. Over and over again. We now have the privilege of retuning to our homeland. We can now adhere to the original Israeli custom of lighting the candle by the door of our homes or the gate of our yard, without fear. When we recite "Ha-Nerot Hallalu", we should remember its origin in that obscure period of Palestinian history, and the great leader who died in a dark pit but spread the light of hope and salvation around the Jewish world. Football/FIFA is a Metaphor for the UN. "...to improve the game of football constantly and promote it globally in the light of its unifying, educational, cultural and humanitarian values, particularly through youth and development programmes"
So why is FIFA trying to rebuild (again) the destroyed Football stadium in Gaza? It was most recently destroyed (again) by the IDF 2 weeks ago, after Hamas used the stadium to shoot Fajr-5 rockets at Greater Tel-Aviv and at Jerusalem. FIFA secretary-general Jerome Valcke has pledged that soccer's world governing body will help rebuild the Palestine Stadium in Gaza City, after it was partially destroyed in Israeli air strikes. "We see it our mandate to rebuild football infrastructure which has been destroyed," Valcke was quoted as saying on fifa.com. "We will also rebuild the stadium in Gaza, which has been destroyed. "Soccer brings people together and we will support any re-construction necessary when football infrastructure is destroyed through disasters," added Valcke, who is in Brazil for the draw of the Confederations Cup. Reports have estimated that the cost of the damage at the 10,000-seat stadium could run into millions of dollars. The venue is one of three international stadiums used by the Palestine national soccer team, with a second the West Bank and a third in annexed east Jerusalem. 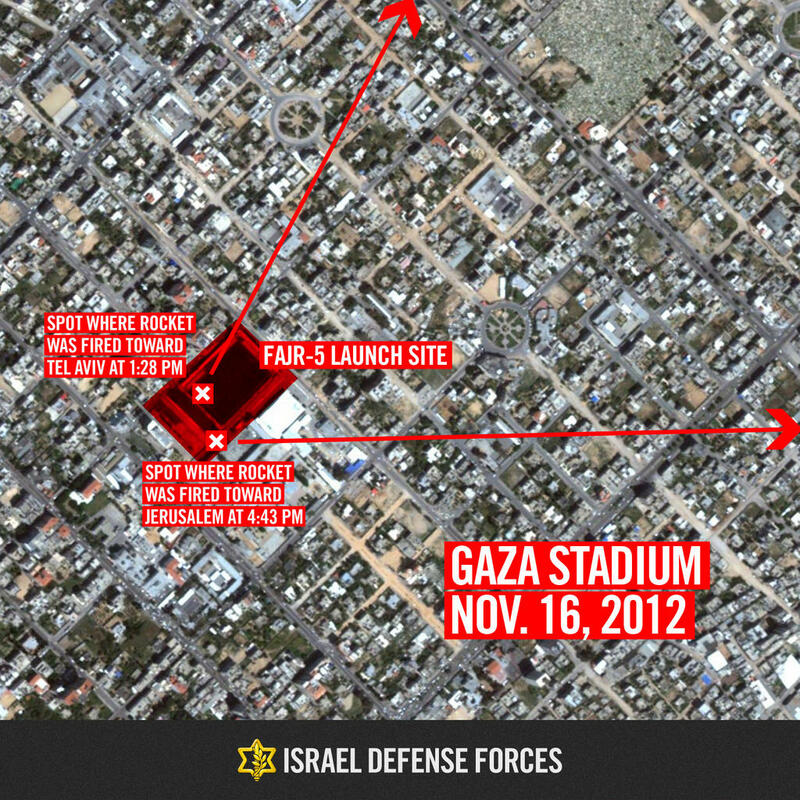 Football/Soccer only brings people together when stadiums aren't being used to launch rocket attacks against neighbors. FIFA says above that the stadium was destroyed by a "disaster" which is why they are rebuilding it. The "disaster" is Hamas, and till Hamas is no longer active in Gaza, the FIFA stadiums will continue to be used to launch rocket attacks against Israel, and the IDF will be forced to destroy the stadium again. The United Nations today is poised to accept "Palestine" as an observer-status country -- Palestinians use their infrastructure and donations to fund terror against Israel and infuse their children with hate. The naivete of FIFA in rebuilding Gaza's football stadium is the same foolishness of the United Nations in upgrading "Palestine" to an observer country. See how Israeli kids cope with rockets being shot at them around the clock...and the songs they sing. Fascist....Radical...Ultra-nationalist....these words were used over and over again by Channels 1, 2, and 10 TV. Channel 10 repeated as a mantra last night that the new Likud list is fascist and illegitimate. Despite what the media and left would have you believe, the Likud list is not full of blood-sucking zombies and vampires. This morning, a Maagar Mochot poll for Nana and Channel 10 TV shows that despite the best efforts of the media, Israelis are happy with their options. The center-right wing is strengthened to 70 seats, while the center-left drops to 50 seats. Israel: Don't be brainwashed by the media. We don't need more left wing parties disguised as "center" such as Livni and Mofaz. The Likud has a responsible and energetic list of MKs who will continue to help lead Israel through the challenging times ahead. Irresponsible fiscal policy from Labor would be the worst thing for Israel, which under the Likud government has managed to maintain a steady course as world markets experience serious turbulence over the past 4 years. Congratulations to the Likud -- you have an excellent list, and we need to all work together for a better future for Israel. This past week's Olam Katan Parsha page featured a commentary article by Rabbi Avraham Wasserman about the TAMA 38, Israel's plan to limit damage from future earthquakes. ".. the construction [based on TAMA 38] is focused in the Gush Dan region, a place where there were no fatal earthquakes in recorded history. In 1837 an earthquake destroyed Safed and Tiberias and caused hundreds of fatalities..."
Most earthquakes in Israel originate in the Dead See Rift (ie, the Jordan Valley). The valley and nearby mountain regions are most at-risk for earthquakes and so places like Tiberias, Safed and Jerusalem have suffered many devastating earthquakes. Beit She'an practically disappeared from history after it was hit by an earthquake in the 8th century. But it's of course incorrect to say that other places in the country haven't been affected as well. The reason Gush Dan hasn't been affected much is because until Tel Aviv was built, it's been relatively empty. In fact, for most of the past millenium the entire population of Israel was less than half a million (and possibly even a quarter of a million). However, we do know that the big city in the area - Ramla - was hit by earthquakes several times. The big one, in 1068, destroyed the city and left tens of thousands dead. It never regained its status as regional capital. The city was again destroyed by the earthquake of 1546, suffering casualties once again. It took years for the city to recover. It all depends on where along the rift the earthquake centers, and how forceful it is. On a related note, the Gush Dan region faces another threat - earthquakes elsewhere in the Mediterranean or along the Mediterranean coast can cause tsunamis. There have been several such recorded incidents. Today about half the country's population - more than 3 million people - lives in the Gush Dan area. We should learn from history: A big enough earthquake could be disastrous. Zeev Elkin, Tzippi Hotovelli, Danny Danon, Gidon Saar, Moshe Yaalon, Ruby Rivlin, Moshe Feiglin. 11:59 AM Likud Primary elections continue today....for those of you who are Likud members and didnt vote yet -- this video is for you. 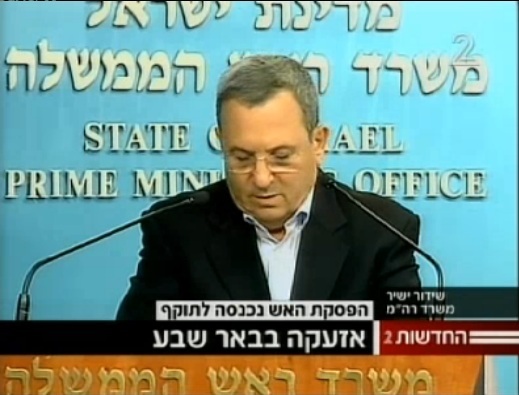 "Elkin Style"
11:07 AM In a self-announced "dramatic" announcement at a press conference, Defense Minister Ehud Barak is leaving Israeli politics -- and will not run in the upcoming elections. He will remain as Defense Minister till after the elections and a new government is sworn in. 2. Joining another party to run for the upcoming elections (though both Labor and Livni deny any connection to it). 10:00 AM Likud primaries continue today due to severe computer issues yesterday. What an embarrassment -- The High-Tech "Start-Up" Nation can't even get its act together for a simple voting application? I'm ashamed. I will continue to update on a daily - semi daily basis....on life in Israel...however, today is a very important day -- the Likud internal "primaries" election. You get to choose 12 people and then a 13th regional candidate. The above are all proven defenders of the State of Israel and have pushed for a proud, Zionist agenda. As you can count, the above is only 8 people. The following list are options to chose for the following 4...who in my opinion have shown rather good judgement though aren't on the list above. This list is a mix from "Matot Arim" and personal observations. For your 13rth vote -- the regional candidates -- the following list is from Matot Arim, and I agree with it. More updates later....Go out and VOTE! Good Morning World from the Hills of the Shomron...this will be the open thread for Friday, the 23rd of Novemeber, 2012. 11:50 AM (Friday) JewishPress.com report that the IDF killed 2 Gazans and wounded a dozen more near the Gazan border. 33% of Israelis are in favor of the cease fire with Gaza. 26% Both sides won equally. Happy Thanksgiving to all our U.S. readers. Just realized that all of today's updates were being put in yesterday's thread. Sorry about that...Join us at the top of the blog www.muqata.com for Friday's updates. However....tonight, the Imam (religious Islamic leader) of Akko and many of the respected Muslim families in Akko went to the Ohr Yosef yeshiva and apologized profusely to the Rosh Yeshiva and presented him with a huge flower arrangement. Nice to see when people do the right thing. Kudos. The terrorist was apprehended in a joint operation conducted by the Shin Bet, Israel Police and the IDF. Twenty-nine people were injured in the attack. The Shin Bet said Thursday that the terrorist, an Israeli citizen who previously lived in the West Bank and was allowed to settle in Tayibe under the family reunification law, was recruited by a terror cell from the village of Beit Liqya, near Ramallah. The terror cell members used a car belonging to the suspect's employer to transport the explosive device into Tel Aviv. The employer, an east Jerusalem resident, had no knowledge of the plan. According to the Shin Bet, the suspect placed the bomb on the bus and then called the terror cell's commander in Beit Liqya, who then activated it via mobile phone. More arrests are expected. 7:52 PM The Success behind the Iron Dome...a brilliant high-tech team, and rocket parts that come from Toys-R-Us. "At the beginning of our journey [to create the Iron Dome], it simple almost impossible. We believed we would succeed, but the challenge was unprecedented. In retrospect, its clear that the [time and financial] limitations imposed on the project which seemed insurmountable are what led to extremely creative and successful ideas. The simplicity is not only in design, but in the manufacturing process. The manufacturers have told us this is the simplest rocket that have ever produced. As scientists, its true we dream of sitting in offices with unlimited time and budgets to create perfect products. Yet the reality and limitations forced us to "break our heads." There are rocket components that are FORTY TIMES CHEAPER than those we normally wound purchase. I can even give you a scoop -- this is the only rocket in the world which includes parts from toys from "Toys R Us". One day, I brought my son's toy car to work. We passed it from one to another and saw that it has components that would be useful for us. More than that, I cannot tell you... (Source). Atzmaut (Ehud Barak), and Kadima (Shaul Mofaz) don't pass the minimum level of votes to get any seats. Likud has dropped since before the Gaza operation, when they were between 40-43 seats. 4:37 PM Baruch Dayan HaEmet -- IDF Lieutenant Boris Yarmolnik, 28, who was seriously wounded yesterday by a Hamas mortar attack in the Eshkol Region, died of his wounds a little while ago in Saroka Hospital in Beer Sheva. Hashem Yikom Damo. 4:21 PM Galei Zahal (IDF Radio) - Hamas says that the current rain storms in Israel are "proof" that they won the war, since these are "Victory Rains". 3:51 PM NY Times Quotes the Muqata! Over 20 rockets fired at Israel since the cease fire went into affect, and life is not yet back to normal in the south, check back regularly throughout the day for updates. 10:13 AM That was quick. Rocket(s) - Ashkelon Beach. Does Israel now get to report the ceasefire violation to Egypt? 9:33 AM Over 60 Palestinians rounded up in Judea and Samaria (West Bank) as IDF tries to quash growing Initifada, as dozens of serious attacks against Israelis have occurred over the past week. 9:30 AM Ma'an News agency reports that Arab on Arab violence continues as 1 Gazan was killed and 3 more injured due to celebratory gunfire. See the top of the blog -- www.muqata.com for Thursday's Open thread updates. 12:12 AM (Thursday) As rockets continue to fall on Israel, the official IDF blog announces the end of Operation Pillars of Defense. 11:01 PM Hamas and Islamic Jihad declare the cease fire to be an Israeli failure. 9:00 PM This picture says it all. "Cease Fire Starts....Air Raid Sirens in Beer Sheva"
8:59 PM With one minute to go till the ceasefire...see on facebook in Hebrew: Only in Israel will you find a Prime Minister that Talks like Churchill but acts like Chamberlain. 8:53 PM Eshkol Region Mayor says he will not open schools tomorrow despite "cease fire". 8:45 PM Air Raid Sirens in Lachish, Ashdod, Ashkelon and Gan Yavneh, Kiryat Melachi. 8:33 PM Ynet reports that a rocket was shot at Israel from Sinai and landed near a community near the border of Israel/Sinai. 8:31 PM Air Raid Sirens in Eshkol region. 8:27 PM Lachish and Ashkelon - Air Raid Sirens. 8:19 PM Air Raid Sirens in Ashdod, Netivot, Beer Sheva. 8:12 PM President Barack Obama spoke with Prime Minister Benjamin Netanyahu and commended him for agreeing to the Egyptian ceasefire proposal, the White House said. 8:08 PM No injuries in mortar attack on Metullah. 8:06 PM IDF Homefront command orders everyone in Eshkol region into bomb shelters immediately till further notice. 8:06 PM Mortar shell fired at Israel from Lebanon lands in Metullah. 8:03 PM In the previous rocket attack on Beer Sheva minutes ago, a rocket scored a direct hit on a house in Beer Sheva. No Injuries. 7:53 PM Air Raid Siren in Tifrach area. 7:52 PM Air Raid Siren in Beer Sheva! 7:43 PM There will be a joint press conference at 8:30 PM by PM Netanyahu, DM Barak and FM Leiberman. 7:28 PM US Secretary of State Hillary Clinton -- Cease Fire announcement starting now in Cairo. 7:00 PM I'm going grocery shopping people...and will not be updating the blog for at least 2.5 hours. Should resume by 10 PM at the latest...unless something big happens. Remember -- if there IS going to be a cease fire, the coming hour is the most dangerous. 6:59 PM Five Israeli vehicles damaged by Palestinian rock throwers on Highway 55 near Azzun. No injuries. 6:57 PM Channel 1's Amnon Abramovitz: Tonight at 8 PM, US Secretary of State Hillary Clinton will announce the cease fire. 6:12 PM Reports from moments ago that a terrorist was captured in the Modiin area. 6:09 PM Ongoing hunt for terrorists in the Modiin area. Traffic jams throughout Central Israel as police roadblocks are set up everywhere. 5:44 PM From the Elder of Ziyon Blog - How did baby Omar Mishrawi die? 5:38 PM Air Raid Sirens in Shaar HaNegev area. 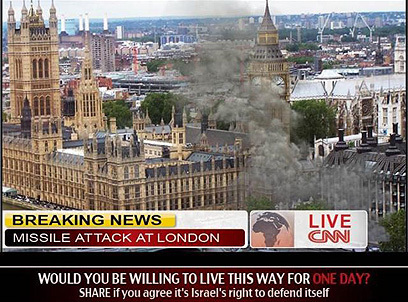 5:27 PM Roni Daniel - Channel 1 TV Military Correspondent: The Hamas is desperate for a cease fire. Now is the time to hit them harder! 5:08 PM US Embassy to personnel: STAY AT HOME! I think they have gone a bit overboard. 5:05 PM Reports of 3 wounded in rocket attack in the community area near Gaza...no air raid siren sounded prior to the rocket strike. 4:51 PM 5 Minutes ago a rocket landed in the Eshkol region. No damage or injuries reported. 4:50 PM IDF using heavy artillery against targets in Beit Lahiyeh and Nusrayat in the Northern Gaza strip. 4:08 PM Israel says to the world: The attack in Tel Aviv this morning will complicate a cease fire. 3:00 PM Arutz Sheva reports of s slight improvement for the woman seriously wounded yesterday in Gush Etzion on the Hussan bypass road near Beitar Illit. 2:55 PM Jubilation in Gaza over the attack in Tel-Aviv today. Music and Koran blaring from mosques and residents are firing in the air in joy. 2:12 PM IDF: Our forces just attacked 3 Hamas terrorists as they tried to launch rockets towards the State of Israel. This attack is part of the over 100 targeted attacks by the IDF since this morning. 1:58 PM Regarding the earlier update about the 9 Cabinet Ministers meeting -- the meeting will be at 2;30 PM at the Kiriya in Tel Aviv, and was planned before the attack today in Tel Aviv. Therefore, the original intention was probably to discuss the cease fire...though now it will center more on the Tel Aviv attack. 1:40 PM Over the past hour, Air Raid sirens continue to be heard in Southern Israel. 1:27 PM The Israel Senior Government Cabinet (9 Ministers) are meeting now. It is unclear if the purpose of the meeting is to give the green light for a ground incursion, or to accept/negotiate the cease fire. 1:22 PM Trying to make some order in the news. 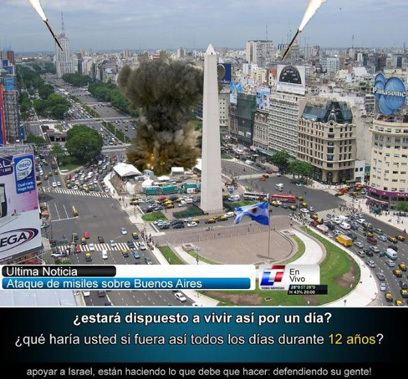 - In the attack on a bus at 12:02 PM today, 21 people were wounded. 2 are in moderate to serious condition, and the rest are in light condition. 1:06 PM Extremely conflicting reports going on now. Breaking News: Israeli police are closing the Azrielli Towers. Reports that a female terrorist has been apprehended. It will take some time for the picture to become clearer...Reports on Channel Bet Radio of an additional explosion in Tel Aviv which has not been confirmed. 12:25 PM Initial reports: Terrorist left the bomb on the bus and then left. 12:18 PM Channel 22 reports 10 lightly wounded on the scene. Reports of additional wounded have already made their way to local hospitals. 12:16 PM All forces moving away from the area, putting on bullet proof vests and helmets due to a serious threat of a secondary explosive device on the bus. 12:14 PM Apparently the bus was empty, or had very few passengers on it. Only a small number of wounded being treated. 12:13 PM ALL FORCES LEAVING THE BUS AREA - SERIOUS CONCERN OF SECONDARY EXPLOSIVE DEVICE ON THE BUS. 12:12 PM Concerns of a secondary device in the area of Tel Aviv -- Emergency Medics taking cover, helping wounded quickly evacuate the area. 12:02 PM Report of Bus Explosion in Tel Aviv, King Shaul Street. Mass Casualty Incident Declared by Magen David Adom. 12:32 AM OK people - time for me to go to sleep. Blogging will resume in the morning....see you then. Wishing a quiet night to Israel, and a prayer for our soldiers. 12:29 AM IDF reports of 25 successful airstrikes on quality targets in the past 30 minutes. 12:04 AM Updates coming momentarily....setting up today's blog post. 12:02 AM Residents of Beit Shemesh and Tel Aviv report hearing loud explosions a few minutes ago. No rocket intercepts or Air Raid sirens reported. 11:48 PM IDF Airstrikes on Gaza - Ashdod residents clearly hearsthe massive attack now. 11:27 PM Air Raid Sirens in Ofakim and surrounding areas. 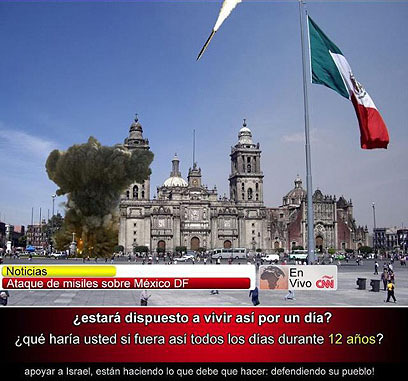 YNET also notes that these transmissions interruptions only occurred on personal home dishes. 11:06 PM IDF artillery and IAF airstrikes pounding the South Gaza strip. 10:53 PM Demonstrations throughout the South of Israel -- Ashdod, Sederot, Ashkelon, Kiryat Melachi -- YES TO GROUND INCURSION - STOP THE ROCKETS - BRING QUIET TO THE SOUTH. 10:29 PM Ehud Yaari (channel 2) TV: Israel has bombed Rafiah (South Gaza) and it is going up in flames. The damage to Rafiach's gas terminal is in the tens of millions of dollars -- this has shocked the Hamas to its core. Yaari says that the Palestinian Parliament building which was built for 10 millions dollars has been totally bombed and destroyed less than an hour ago -- a strong and humiliating blow for Hamas. 10:02 PM Furious residents of Ashdod demonstrating against possible cease fire. Residents call on government to start ground incursion and destroy the Hamas. 9:55 PM Israelis demonstrate outside minister avi dichter's home: Destroy the Hamas. Let the IDF go into Gaza and permanently stop the rockets!!! 9:05 PM At this point 56,000 reserve soldiers have been called up to military duty. 8:25 PM A female driver was shot near the Husan bypass near Beitar Ilit in a drive-by shooting. Medical forces are treating her on site, but she is in serious condition. UPDATE: Injuries caused by rock attack, not shooting. 8:00 PM Permitted for release: Reserve soldier killed by mortar fire in Eshkol region. 7:51 PM Netivot and S'de Negev now under rocket fire. 7:45PM A total of 8 rockets were fired at Be'er Sheva. 3 were shot down by the Iron Dome system. 7:33 PM Four rockets fall in Be'er Sheva. Sirens in Be'er Tuvia, Ashkelon, Kiryat Melachi. One rocket falls in built up area, no injuries. 7:32 PM Senior Israeli sources deny that there is any agreement on a cease fire. 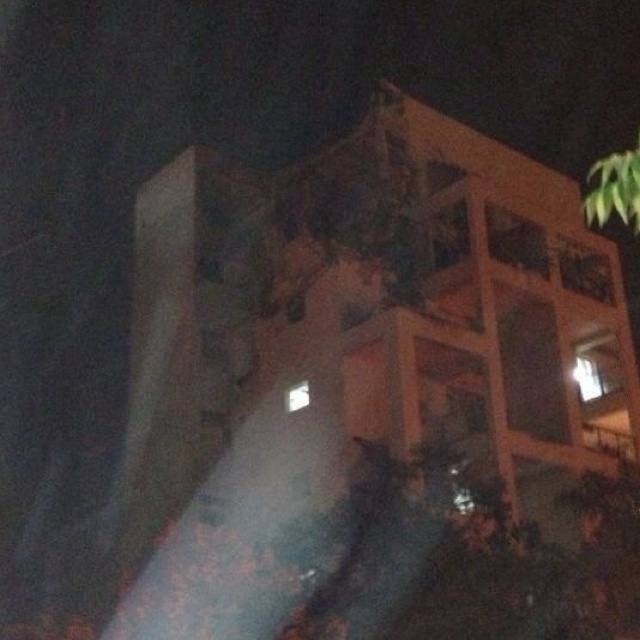 7:09 PM Photo of building hit by Gazan Fajr5 rocket in Rishon LeZion. 6:05 PM Sirens in Rishon, Gan Raveh, Palnachim. Reports of one wounded seriously in earlier rocket attack on Ashkelon. UPDATE: woman lightly injured from attack on building in Rishon. 5:08 PM Air Raid sirens in Eshkol region. 5:08 PM Gazans say they shot 5 rockets at IDF Navy Warship. The rockets missed. No injuries, no damage. 4:57 PM IDF attacks Gaza terrorists -- Palestinianss report 1 dead, 16 wounded. 4:55 PM Despite promises from the Hamas that everything will "be ok", Gazans swarm out of Northern Gaza, fleeing to Central Gaza in accordance with IDF flyer's request. 4:13 PM Palestinians rioting in village near Gush Etzion where Hamas rocket landed. Reports of an IDF soldier lightly wounded. 4:11 PM Gaza: Reports that 6 people killed in targeted IDF strike - on 2 cars. 4:09 PM Direct hit on a Makolet (small grocery store...like a Bodega in Washington Heights) in Ashdod, 3-4 people lightly wounded. 3:51 PM Israel Radio reports that there was another shooting incident from Syria at an IDF jeep in the Golan Heights, and that the tire of the jeep was damaged. No injuries. Israel has submitted a complaint to the UN which I'm sure resolve the issue. 3:48 PM Foreign Minister Avigdor Leiberman had to hang up on the Japanese Foreign Minister because of the rocket attack and Air Raid sirens in Jerusalem. 3:48 PM Air Raid sirens in Sederot. 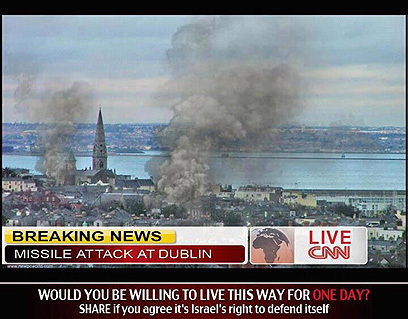 3:45 PM Hasbara campaign: Would you be willing to live like this for one day? 3:43 PM IDF hits Gazan anti-tank team near Gaza's border with Israel. 3:29 PM 5 people lightly wounded and 10 treated for shock -- rocket landing in a community very close to Gaza. 3:27 PM Air Raid Sirens in Lachish area. 3:26 PM Photo of people at the Kotel running for cover during the Air Raid siren at 2:13 PM today. 3:13 PM Hamas threatens: If there is an IDF ground incursion, we will kidnap soldiers. 3:05 PM Air Raid Sirens in Beer Sheva...and other areas. 3:01 PM The Knesset Foreign Relations and Security Committee unanimously approves call-up of additional 10,000 IDF reserves soldiers -- making a total of 70,000 soldiers called up via emergency Tzav-8 call up orders. 2:45 PM Reports of massive IDF artillery attack with combined airstrikes on Gaza at this time. 2:43 PM When the Air Raid siren went off, it also went off in Maaleh Adumim (for the benifit of our Maaleh Adumim readers). 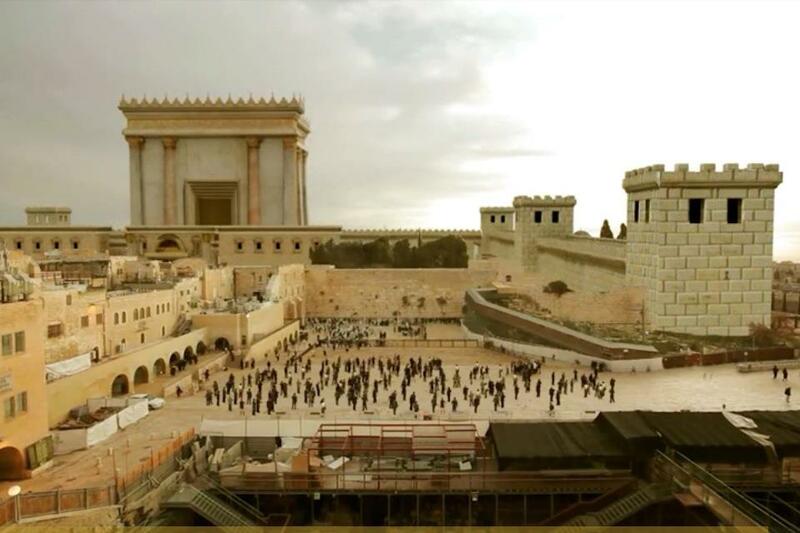 The boom was heard throughout Jerusalem...and Modiin, Gush Etzion, Beit Shemesh and other places as well. 2:35 PM One person very seriously wounded in Eshkol rocket attack minutes ago, one wounded lightly. IDF censor preventing release of additional information at this time. 2:32 PM Serious rocket strike in Eshkol region. Reports of wounded. Medical teams on the scene. 2:30 PM Reports that the Gazan fired rocket at Jerusalem landed in an Arab village -- will not specify location. No injuries reported. 2:13 PM Sirens in Jerusalem....had to run to a shelter. Didn't hear any booms...updates coming soon. 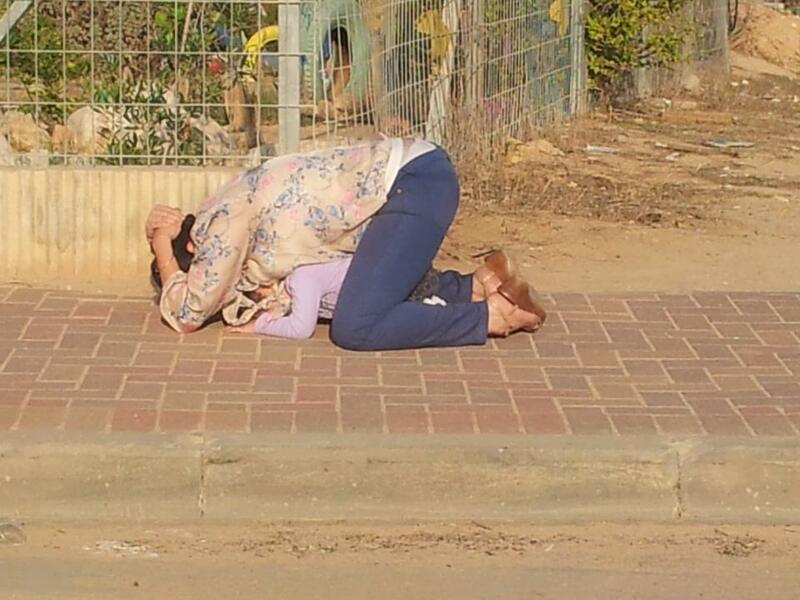 2:12 PM An Israeli mother shields her child during a Palestinian rocket attack in Ofakim. The Israeli Ground war will result in a major blow to the families of IDF soldiers. The enemy will pay dearly for the great, disgusting act commited against Jabri the leader, and the Palestinian people of Gaza. 2:00 PM Beer Sheva Region - rocket barrage on its way. Air Raid Sirens..
1:57 PM IDF strikes a terrorist cell that was launching rockets in Gaza City. 1:48 PM Air Raid Sirens in Ofakim. 1:27 PM Reports that the Knesset Foreign Relations and Security Committee meeting now to discuss authorization for another 10,000 IDF reserve troops to be called up. 1:08 PM Channel 2 TV: Israel totally rejects idea of removing blockade around Gaza. 1:07 PM Ongoing Palestinian Riot in Hevron; Rocks being thrown at IDF soldiers, burning tires being rolled at IDF soldiers....IDF using crowd control tear gas. 12:54 PM Channel 2 Israel TV reports that the Palestinians in Gaza have rejected Israel's terms for a cease fire. 12:44 PM Air Raid Sirens in Sederot. Hundreds of Palestinians rioting in Hevron, waving Hamas and Fatah flags. Throwing rocks at IDF soldiers. 12:31 PM Israeli-Druze MK Ayoub Kra: I think we must start the IDF ground incursion to finally bring quiet to the South. We can not capitulate. There is no places for weakness in the Middle East. 12:22 PM IDF attacking in Dir Al-Balach. 12:15 PM More details, the solider is a 40 year old Reserves Tank Officer, wounded by shrapnel to his chest, and was transported by helicopter to Saroka Hospital in Beer Sheva. 12:12 PM IDF Spokesman allows us to publicize: The person wounded this morning in the Eshkol region is an IDF soldier, listed by the IDF as being in "moderate" condition. 11:48 AM Israeli Government Ministers taking turns with soundbites: Yaalon; Quiet will be met with quiet. Shteinitz; We have exacted a stiff price from Hamas and they will think twice before shooting at us again. 11:42 AM From the JPost: The Iron Dome system intercepted a total of 18 rockets fired into Israel from the Gaza Strip Tuesday morning, police said. 11:40 AM IDF Radio reporting the US Embassy attack was "criminal" not "nationalistic"
11:27 AM Reports that the attacker of the US Embassy may be an Israeli. Insane. 11:23 AM US Embassy Attack Update: After the Arab attacker lunged at an embassy guard with an axe, the attacker was shot in the leg by security guards. Why they didn't kill him is a mystery. 11:20 AM Reports that the person injured in rocket attack in Eshkol region this morning -- is in serious condition. 11:19 AM Update on attack near US Embassy in Tel Aviv: Arab attacked guard at US Embassy with an axe. The guard was lightly wounded in the leg. The attacker was arrested...Details later when they are available. 11:15 AM INCORRECT reports in news media of a shooting attack near the US Embassy in Tel-Aviv. There was NO shooting attack. 10:41 AM IDF firing at terror cells in Nusayrat, Eastern Gaza strip. 10:33 AM Minister of Homeland Defense, MK Avi Dichter says the chances of a cease fire vs. escalation/ground incursions are equal. 10:28 AM Reports that 2 rockets landed in Beer Sheva in the previous attack. MDA forces responding. No known injuries as of this time. 10:22 AM Reports of a rocket landing in Beer Sheva....IDF and MDA forces responding. 10:20 AM Channel 2 TV reports that the IDF successfully executed a targeted killing in Gaza. No reports yet as to the identity of the terrorist. 10:08 AM IDF Radio changes the wounded person's status to moderate. 6:00 AM - 10:00 AM Dozens and dozens of rockets are fired at Southern Israel. Many of them intercepted by Iron Dome. plays current Israeli music, and every single rocket launch and location is announced. 9:12 PM IDF soldier kills Arab in Southern Mt. Hebron area. An Arab near Halhul attacked a soldier,in a kidnapping attempt. The soldier shot the terrorist. Simultaneous to the attack, Palestinian websites reported that an IDF soldier was kidnapped. It appears the site jumped the gun. All traffic in the are was stopped as soldiers searched to make sure no soldier was missing. 7:50 PM Prime Minister Netanyahu, Foreign Minister Liberman and Defense Minister Barak discussing terms of the cease-fire with Hamas at 9 PM tonight. 5) President Morsi will be personally responsible, and sign as 3rd party guarantor. 6:57 PM Prime Minister Netanyahu today to Hasbara activists: We are in 4 different fronts, Homefront, Military, Diplomatic and Hasbara. Your work in disputing the lie industry is a significant addition to the State of Israel. There will be many great efforts needed in the coming days. 6:45 PM Reports of another successful targeted killing -- 2-3 senior terrorists killed in Al-Buriej, Gaza, from the Popular Resistance terror group. 6:01 PM Arab rioters in Hevron throwing rocks at Beit Hadassah. Earlier today, IDF troops shot dead an Arab rioter who threw a firebomb at IDF troops. 5:55 PM Islamic Jihad Spox: Our retaliation against Israel [for killing 4 of our senior commanders] will be difficult, swift and painful. Ouch. Sorry for the font issues....working on it. 6:05 PM Reports of light weapon fire over Israeli forces from Syria. 6:00 PM Sirens going off in Ashkelon, Iron Dome knock down rockets over the city. 5:40 PM Lebanese forces defuse 2 GRAD missiles aimed at Israel from its territory. 5:37 PM IDF Spokesman releasing names of Islamic Jihad terrorist leaders targeted in strike on communications building in Gaza. Keep in mind that the building is the HQ of the foreign press in Gaza. 4:46 PM Air raid siren sounding in Netivot. 4:42 PM Reports of SA-7 Grail Surface-to-Air missile at unmanned drone east of Gaza. 4:40PM 7 rockets fall in Eshkol region. No injuries. 4:30 PM More air raid sirens in Sha'ar HaNegev. IDF destroys Hamas communications building in Gaza UPDATE: Palestinian sources reporting that Ramaz Harab, one of the commanders of Islamic Jihad's military wing killed in attack. Well done! 4:04 PM Egyptian sources: Armed group blowing up IEDs on Sinai border. 2:48 PM Palestinian violence near Rachel's Tomb (Kever Rachel). Palestinians fighting with police. Bonus Video: After foreign activists and protesters block the main road, one driver decides not to let their "non-violent" violence get in his or her way. 1:56 PM Beer Sheva, Negev. DON'T GO OUTSIDE! Large barrage on its way! 10:43 AM Grad hits Ashkelom School. School was empty, thank God. A 40% decline in rocket launches from Gaza into Israel. Israel destroyed 40 tunnels between Rafiach and Sinai. In the past 12 hours, IDF has hit 6 rocket teams. Israel will continue to issue warnings by breaking into the Gazan radio channels warning them away from areas to be attacked and away from Hamas and Islamic Jihad soldiers so they won't be injured. 10:17 AM 60,000 reserve orders sent out so far. IDF attacked 80 terror sites, 1,350 since the beginning of the operation. Underground rocket launching sites that shot at Kiryat Melachi were destroyed. Building belonging to senior terror officials were targeted that were used as command centers, or as weapon storage facilities. A number of rocket crews were killed. 6:56 AM No school today within a 40 KM radius from Gaza. Loud explosions were heard in Ashdod at 6:43 AM, but not clear from what. 6:54 AM Good morning Israel. Muqata reporting will begin soon.